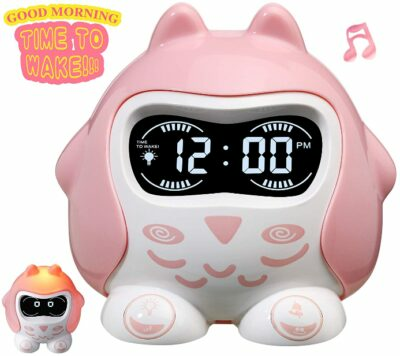 Alarm clocks for kids come in a wide range of types and styles, from cute starry displays to amazing cartoon characters. Such clocks are usually designed to assist your kid fall asleep more peacefully and get him or her up every morning in a punctual, fun, and friendly manner. The other vital importance is that they encourage a sense of personal responsibility and early independence as your little tyke grows up over time. Here, we are going to be reviewing 14 of the best kids alarm clocks available in 2019 that will definitely benefit your kid. 1.14.1 Why Choosing Fun Alarm Clocks for Kids Is a Good Idea? 1.14.2 Do Any of These Kids Clocks Have a Radio Inbuilt? Clocks for kids are flooded in the market today making it a challenge for any parent to make a great option. Read on for a guide to factors you should consider before making a purchase. You should consider purchasing a clock with adjustable volume. Some kids need a soothing and gentle sound to wake up. Others that have quite a deep sleep and they need a loud blast to wake them up. Get an alarm that you can adjust its volume to suit your situation. Purchase an alarm that will create a lighting illusion in your kid’s room when it’s wake-up time. Lights will trigger your child’s body hormones such as cortisol, and this will make it easier for him or her to wake up. However, ensure that you choose the right degree of brightness that suits your kid’s specific needs. Your child’s clock should be durable, in that it cannot be damaged if it mistakenly falls off. You can go for a clock with a silicone cover; it reduces friction meaning that it will hardly slide. Go for a clock that is pocket-friendly, but be sure of the quality. 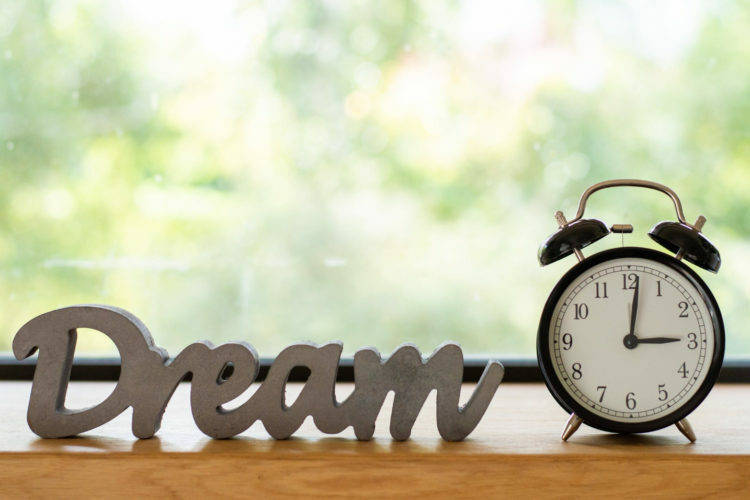 You can purchase a used or a new alarm clock; it entirely depends on the financial capability of the buyer. A new clock is much more expensive hence you should consider a used one if you have a controlled budget. Look at the ease of usage as well. Here, we have reviewed some of the best children’s alarms for you to choose from. There is something to appeal to all tastes, and all of these clocks are packed full of excellent features to help your child learn to get out of bed in the morning! 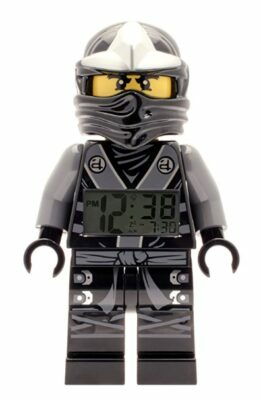 This clock bears a resemblance to the Ninjago character Cole making it an instant hit to any child. In spite of having a youthful look, it is durable, tall, and you can install the batteries easily. Your kid will enjoy the colorful design and the playful bright spirit of LEGO’s Ninjago clock. 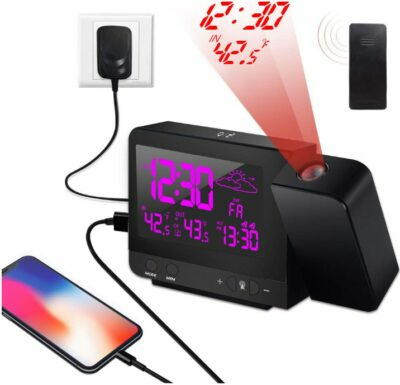 The clock has a backlight that eases use at night and it is also equipped with a readable digital display that has 12 and 24 hours format on the LCD screen. It features a snooze alarm as well. Ok to Wake is a highly reviewed kid alarm clock that teaches kids to sleep more in the morning hours so parents can at least get enough sleep. It includes a digital clock with nap timer, snooze alarm, a hidden panel of parental buttons, and fun face-plates that change in appearance. It also features a great battery backup that plugs into a USB jack directly. Open eyes and green light indicate clear for takeoff – it’s time to get up! This clock can be an excellent teacher, storyteller, and musician to your kid. You as a parent can also benefit from the alarm, you can check weather and news reports, control your smart home devices, and set timer and alarm. The alarm has an in-built 5W speaker that offers rich music and sound even without extra devices. It also includes a remote control, and sleep trainer mode features. The best part is that the alarm will grow with your child: your kid can upload his or her favorite songs and also choose his or her favorite color. This clock is ideal for kids aged 5 plus. It is designed to assist kids to learn to tell the time: it offers an easy step-by-step method that is consistent with readable wrist watches and time teacher clocks. This clock has a crescendo alarm that starts gently and gets progressively louder until you turn it off, it has a built-in light sensor that controls the clock face brightness, and it also has a sweep mechanism. 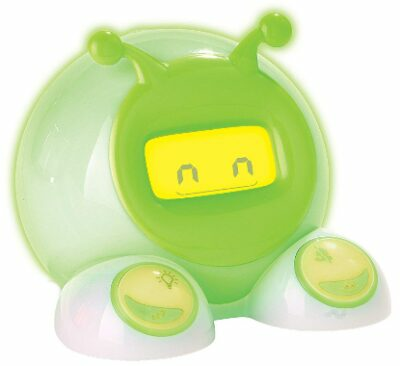 The robot clock is ideal for children who are light sleepers. It operates silently with no tick-tock sound that can be so annoying. You can set up the clock easily: it has two knobs on its back to set alarm time and time. 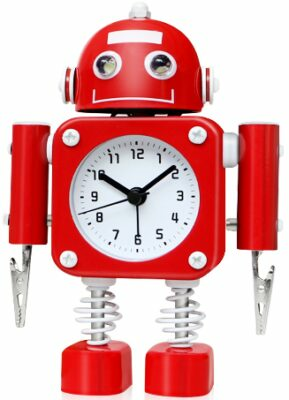 The lovely and cool robot clock is an amazing decoration for children’s rooms. It is battery operated meaning no cords are required. This clock can be a great gift to a child aged 5 plus who is a huge Ninjago fan. It comes with a katana that is removable and batteries are included so you can start using it right away. Kai has movable arms and legs and comes with a plastic sword – kids will love putting him into different positions! The clock is affordable and easy to use, and is also cute enough to act like a decoration in your kid’s room. Lastly, it is perfect for children who are light sleepers. The menacing décor includes a digital clock and lighted display. You activate the back-light and the snooze by pushing down on the minifigures head. 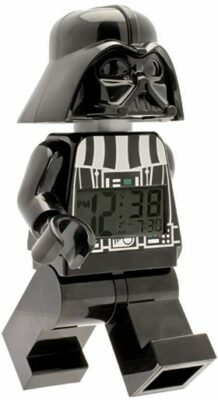 The Star Wars clock is a perfect gift to a kid who is a huge fan of LEGO Star Wars. The battery is included, its arms and legs are movable, it is fully adjustable, the LCD screen has a backlight, and snooze functions perfectly. Overall, this is an all-round excellent choice! In the light of day and in the dark of night, this clock will serve as an Adventure Bay to your child. To make him light up, you need to push Chase’s head down. In case you want to trigger Chase’s sound effects, press the sound button. Simply put, you can easily use the clock. Other features of the clock include snooze and alarm function. The backlit LCD screen is easily readable as well. The clock aids parents get enough sleep. It teaches a child that once the clock glows green, it’s time to wake up. The clock can also benefit a kid who is afraid of the dark, it has colorful lights that will give her a peaceful sleep. It is easy to set, and features lovely, bettery-operated animations. You can also set a nap timer, which will give your child a soothing sleep during the day with no annoying disruptions. The Pictek kids clock has a 3D cartoon dinosaur design that makes it lovely, adorable, and cute – perfect for displaying in your child’s room. The aim of the clock is to train a kid when its time to get up or sleep by using its light and alarm. Your child’s independence will be gradually built and you as a parent will at least have enough sleep. The clock is useful to both light and deep sleepers. It has a touch sensitive night light as well. 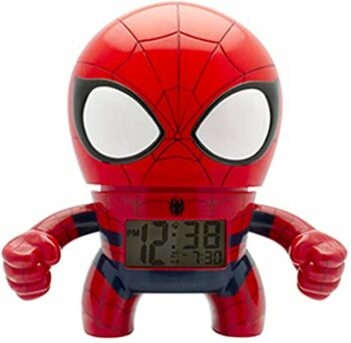 This clock is ideal for kids with a huge love for Spiderman. It has a readable backlit LCD screen as well as snooze and alarm functions. The clock also illuminates and is easy to set. To activate the lights, push down on Spiderman’s head. The volume of the clock is a bit low making it best for kids who sleep lightly. The Orhome digital projection clock has an adjustable angle and ultra-clear projections. Its indoor and outdoor temperature usually monitors and auto time calibration, and for this reason, this alarm can predict the weather based on the barometric pressure trend. 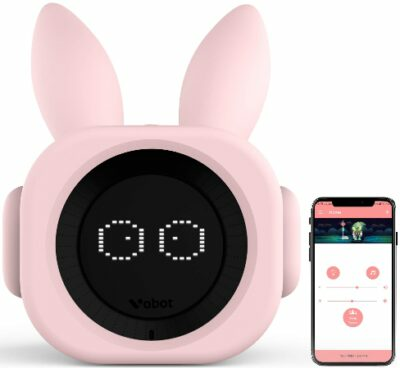 The clock has other great features such as dual alarm that have different purposes with snooze; it allows your kid to have an extra 5 minutes, then the sound changes and the volume rises. It also has a USB charging port and a backup battery. 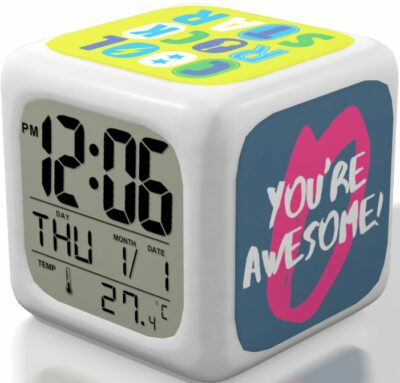 Here is a digital clock ideal for kids and teens. It has a cute design and it is so uplifting and aspiring. It is perfect for heavy or deep sleepers. The clock is operated on 3 AAA batteries. It is refreshing without annoying alarm beeps. It will brighten your child’s day either during travel or at home making him or her start the day pleasantly and smoothly. The clock will also help your child learn how to keep time and not over-sleep. 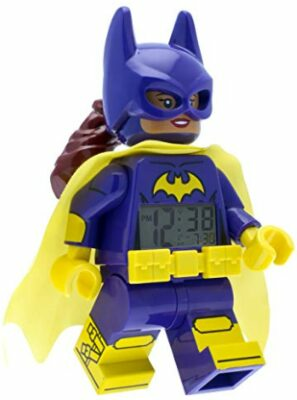 The LEGO Batgirl clock is one of the LEGO décor collections that functions perfectly and is fun to use. It is shaped like a jumbo-sized Batgirl minifigure, so it is sure to appeal to fans of this series. The clock features poseable legs, arms, and wrists, and a handy backlight function. It also has a readable digital LCD display and snooze functions as well. You activate the display lights by pressing down on Batgirl’s head. Why Choosing Fun Alarm Clocks for Kids Is a Good Idea? Every child will hit that stage when he or she is too cool with toys making minimalist and stripped-down options to be welcomed. In addition, it is great to give your child something she or he can look forward to especially in the early school mornings. Purchase a clock that plays songs, looks like the child’s favorite minifig, and lights up. Sweet features that come with fun clocks for kids catch their attention compared to simple alarms. Lastly, solicit your kid’s input in the decision-making. 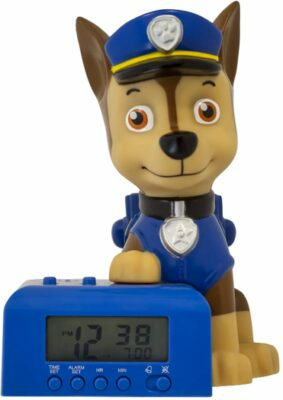 Is Having a Cool Alarm Clock for a Child Gonna Help Them Learn the Time? 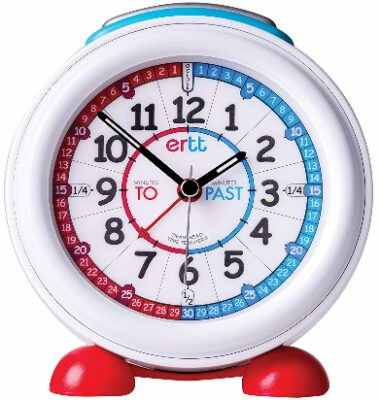 Any parent should opt to purchase a cool clock that can help the child to understand time and numbers. Some clocks can even project the time onto the ceiling, which is a cool feature. Help your child to gradually learn what time he or she gets to bed and gets up. Do Any of These Kids Clocks Have a Radio Inbuilt? Most of the clocks for kids we included in our list have built-in sound effects and music. For instance, the bunny sleep trainer clock has one of the best inbuilt speakers. Simply put, clocks with inbuilt radios are available, but mostly designed for teens.